This coop is perfect for the owner of a small flock. This handsome space saver is made of recyclable plastic and is a breeze to clean. Lightweight and portable, the Hula Coop is ideal for your patio or small backyard. Click here to learn more about The Hula Coop. The clean lines of this attractive A-Frame make it a welcome addition to any outdoor space. 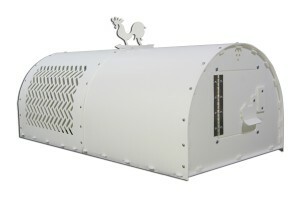 It is made of 1/4″ HDPE plastic and is suitable for 4 large chickens or up to 6 bantams. 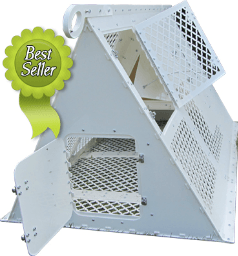 Click here to learn more about The A Frame Chicken Coops. The gracefully curved roofline of the Rainbow Arch provides a comfy home for up to six hens and adds interest to your outdoor space. Keeps your hens and your neighbors happy. Click here to learn more about The Rainbow Arch Chicken Coop. Welcome to the Gothic Arch coop where glamour meets comfort and safety for your flock. This coop adds real pizzazz to your backyard space. 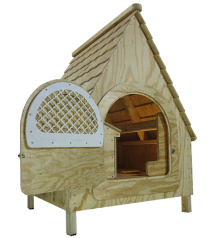 Houses up to six hens in style. 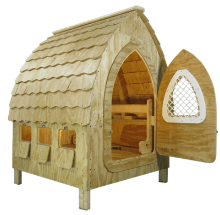 Click here to learn more about the Gothic Arch Chicken Coop. 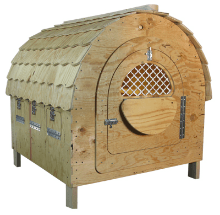 Reminiscent of structures in the Alpine regions of Europe, the Chalet chicken coop houses up to 6 chickens. The A-frame roof provides plenty of space and ventilation to keep hens safe and comfortable while complementing your landscaping. Click here to learn more about the Chalet Chicken Coop. These coops offer the best in portability and style. Be the envy of the neighborhood.